Joseph Clark was born on 4th of July 1834 at Cerne Abbas, Dorset the son of a draper. He moved to London and studied at the Heatherley School of Art, before attending the Royal Academy School. 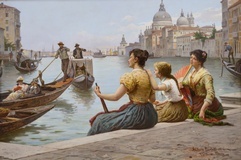 He started exhibiting at the Royal Academy from 1857-1904. 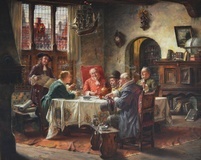 He also exhibited at the British Institution, Royal Society of British Artists, Suffolk Street, Royal Institute of Oil Painters and New Watercolour Society as well provincial galleries. 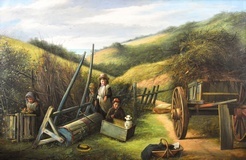 By 1861, Clark had become an established artist and kept a house in Islington and Dorset. He later moved to Hampstead to accommodate his growing family. 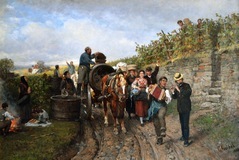 In addition to becoming a highly sought after artist, he achieved success abroad winning a medal and award at Philadelphia in 1876 for two paintings that he had sent over for an exhibition. He was also elected as a member to the Royal Institute of Painters in Oil Colours. 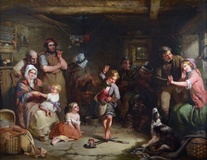 Many of his works are of domestic interiors usually including children and he often used members of his family as models. By 1901, Clark had moved to Harrow-on-the-Hill and in his later years relocated to the Kent coast. He died in 1926 in Ramsgate on his birthday. Examples of his work can be found in public collections including Maidstone Museum, Newport Museum, Sunderland Museum, Sheffield Museum, the Tate and the V&A. Museum, Sunderland Museum, Sheffield Museum, the Tate and the V&A.